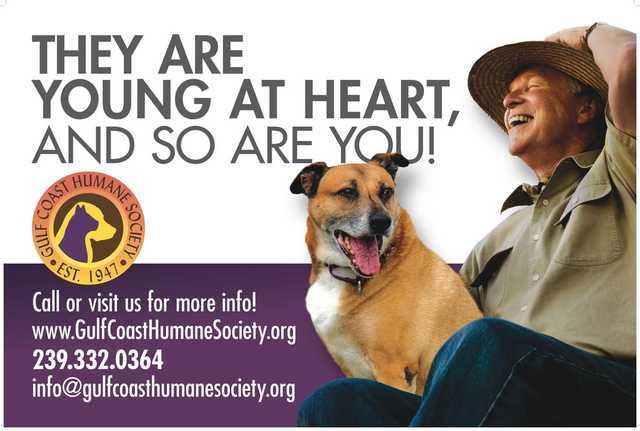 The Gulf Coast Humane Society has launched a Senior to Senior Foster Program, which residents living in independent, 55-plus communities and assisted living facilities will foster senior pets for the mutual benefit of both the animals and the humans. ​Cats and dogs are typically considered a “senior” at eight years old. Pets have therapeutic qualities and are proven to improve mood as well as reduce stress levels. A shelter setting can be stressful for seniors, especially ones who were raised in a home environment. Fostering can help reduce the stress these pets feel as well as improve their temperament. Seniors are often overlooked because people looking to adopt tend to think of a younger pet. However, senior pets are a great fit because they usually have good manners and they still have so much love to give. Older pets are great companions for senior citizens because they can fit into your daily routine easily. These pets are usually content with a more relaxed lifestyle and may not be as active or demanding as a younger pet. “Having our senior to senior fostering program allows a win-win for both. Giving a senior citizen that unconditional love while our senior pets live out their lives comfortably and in a loving atmosphere,” said Jennifer Galloway, executive director of GCHS. Fostering is a great alternative to adoption for seniors, as it requires limited commitment and expense. The adoption center will cover food and medical expenses that are needed for these pets. Please contact the Gulf Coast Humane Society at (239)-332-0364 Ext. 304 for more details about the program. (Pictured) The donation of $8,200 to benefit the Senior to Senior Foster Program, was presented to GCHS Foster Coordinator Alyssa Dudley, by Jordan's parents, Lorraine and Greg Gutheim. The GCHS Senior to Senior Program has gained much momentum in 2017, but thanks to the Jordan Ashley Gutheim Foundation Fund, the foster program will remain strong for years to come. The donation, which was made in the name of Jordan Ashley Gutheim, was in the amount of $8,200. Jordan was tragically killed on May 12, 2016, in a car accident. She was passionate about animal safety, senior citizens and helping those in need in impoverished countries like the Dominican Republic. "This donation will ensure that the Senior to Senior Program will remain a viable option for our senior fosters," said GCHS Executive Director Jennifer Galloway. "The program is so beneficial for our animals and our foster parents. We can't thank the Gutheims enough and will make sure the program remains strong in Jordan's memory." ​To make a donation or learn more about the Jordan Ashley Gutheim Foundation Fund, visit their website.